In a more cynical world weary age the tales of Beatrix Potter could easily be accused of being twee and irrelevant. And yet, world wide, children (and I suspect quite a number of adults) continue to be delighted and enthralled by these anthropomorphic fictions from a bygone era. 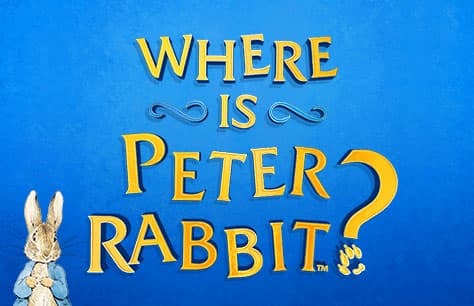 The stage of the Theatre Royal Haymarket is now playing host to dramatised versions of five of these well known stories under the collective title of Where’s Peter Rabbit? Originally created for the Lake District attraction The World of Beatrix Potter, this hour long piece somewhat betrays its origins in its Disneyworld like staging. That said the set is based on Potter’s own drawings and is beautifully realised in 3D by deviser/designer Roger Glossop. A cast of six bring the yarns to life with help from voice overs by Miriam Margolyes and Griff Rhys Jones (both ideal). But it is the puupetry and, indeed, the puppets themselves which steal the show. Here are Jemima Puddleduck, Mrs Tiggywinkle, Jeremy Fisher, Mr Tod, and a number of other famous characters bought to life by their handlers who also supply the voices and they do this superbly. It struck me that although the most famous tale is that of Peter Rabbit’s it is actually less dramatic than some of the others – he’s really just a bit naughty but I suppose that’s why children identify with him. Peter’s nemesis and villain of the piece (if something as gentle as Potter can be said to have a villain) is nasty Mr McGregor who at one stage, and slightly confusingly, morphed into multiple clones of himself with wheelbarrows full of tasty vegetable treats – I wonder if there were any subliminal messages here about getting our kids to eat their greens. It’s difficult to say what age range is being targetted and the theatre website is rather coy on this point saying it is “aimed at families with children age 3+ who we feel are old enough to enjoy, understand and appreciate the production”. The joyful audience reaction to Peter’s eventual and perhaps rather over delayed appearance and the spontaneous clap along to the last song suggested that this had been the case but the show does perhaps lack an element of audience participation/interaction which might have been expected in one aimed at a young audience. I guess it will all depend on when and, indeed, whether, youngsters are familiar with the tales. Even if full understanding is not there, there is still plenty to divert the eye and ear. This show can be summed up in one single word: charming.